News Release — DALLAS and FORT WORTH, Texas — Mouser Electronics Inc., a leading global distributor of electronic components, along with celebrity engineer Grant Imahara, today released the third video in the Shaping Smarter Cities series, part of Mouser’s award-winning Empowering Innovation Together™ program. 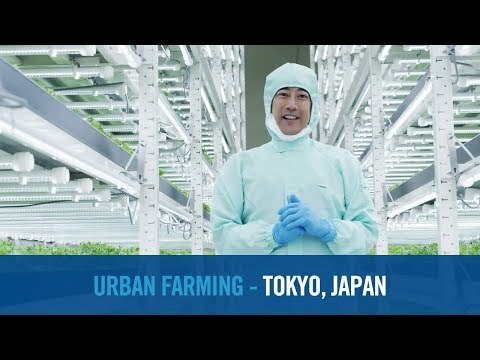 In the third video from Mouser Electronics’ Shaping Smarter Cities project, celebrity engineer Grant Imahara travels to Tokyo to learn how technological innovations in vertical farming are helping to feed a growing population plagued by extreme space restrictions and resource limitations. To learn more, visit www.mouser.com/empowering-innovation. In the latest video, Imahara travels to Tokyo to meet with top executives and engineers from Mirai and discuss new developments in vertical farming. Imahara learns about how these technological innovations are helping to feed a growing population plagued by extreme space restrictions and resource limitations. The Shaping Smarter Cities series is supported by Mouser’s valued suppliers Analog Devices, Intel®, Microchip Technology and Molex. Tokyo has nearly 38 million people packed into 845 square miles, making it the most populous metropolitan area in the world. The sheer number of people in one city creates logistical and infrastructure problems, notably sustainably feeding the entire population. To investigate new solutions to these problems, Imahara visits Mirai’s facilities, learning how indoor vertical farming uses 40 percent less power than traditional farming and leads to 80 percent less food waste and 99 percent less water consumption than outdoor fields. Imahara speaks with Nagateru Nozawa, COO of Mirai, to gain insight into the additional benefits their technology can provide, such as shorter transportation distances from farm to market and the minimized use of pesticides. 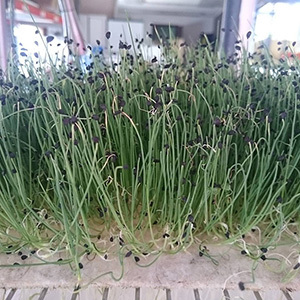 Because the vertical farm is located inside a metropolitan area, fuel and delivery expenses are significantly reduced, further helping the environment while also lowering food costs. The Empowering Innovation Together program has been one of the most visible and recognized programs in the electronic component industry, featuring projects ranging from bringing superhero technology to life to 3D printing a semi-autonomous car with drone technology. The focus of this year’s program is about solving tough problems that impact humanity as a whole. Visit http:www.mouser.com/empowering-innovation for more information. Mouser Electronics, a Berkshire Hathaway company, is an award-winning, authorized semiconductor and electronic component distributor, focused on the rapid introduction of new products and technologies to electronic design engineers and buyers. Mouser.com features more than 4 million products online from more than 600 manufacturers. Mouser publishes multiple catalogs per year providing designers with up-to-date data on the components now available for the next generation of electronic devices. Mouser ships globally to over 550,000 customers in 170 countries from its 750,000 sq. 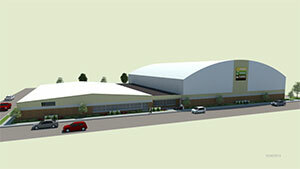 ft. state-of-the-art facility south of Dallas, Texas. 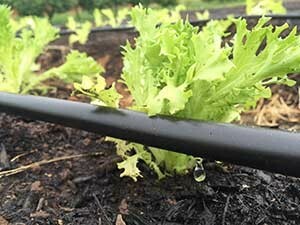 Press release: LAS VEGAS — In what is a watershed transaction and a continuance of plans to integrate world-class indoor agriculture equipment into traditional farming, Indoor Farms of America announces that it has sold the first two “warehouse” style farms to Co-Alliance, LLP one of the largest, oldest and most respected major locally owned Farmer Cooperatives in the United States. “With the sale of these farms, which will be up and running in the great state of Indiana in about 90 days from today, our company has achieved the first stage of the plans to have large scale indoor farming adopted by the very folks who have kept us fed in this country since its inception, and that is the traditional farmer,” stated David Martin, CEO of Indoor Farms of America. The first of the two farms will be owned and operated by a long-time family farming operation, who have an existing building as part of their farming operation in central Indiana, that will be converted to state-of-the-art indoor growing facility at pretty minimal expense. After seeing a solid first year in sales of its game-changing vertical aeroponic farm equipment, Indoor Farms of America is on a path to more than quadruple first year sales in 2017, which is year two. “The largest food-related companies in the world are working with us at this point. They have compared every aspect of every available indoor platform and come back to us. We designed, patented with multiple patents, and now build a fundamentally and economically sound indoor farming product that scales to as large as may be required, anywhere in the world. Nothing grows in quantities that are even close to our equipment, in terms of robust, healthy, clean and nutritious produce,” states Martin. Inside the 7,000 square foot warehouse that houses urban vertical farming operation Artesian Farms. 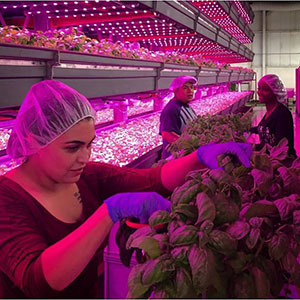 Using artificial light and seven 20 foot high vertical towers and racked trays, the farm produces around 75 pounds of lettuce and kale a week, and approximately 40 pounds of basil per week. Photo courtesy of Artesian Farms. 13 years ago Adams moved from the suburbs of Detroit to the urban neighborhood of Brightmoor—roughly four square miles on the outskirts of Detroit full of abandoned homes and derelict industrial buildings. Netafim’s Typhoon thinwall dripline in the field. Courtesy Netafim. San Francisco-based Farm From a Box supplies all the components needed to create a two-acre off-grid farm, packed in a shipping container that will then serve as a farm building. It recently announced a new partnership with Netafim, an Israel-based irrigation firm with offices in 120 countries, to supply the irrigation components. Farm From a Box is the brainchild of partners Scott Thompson and Brandi DiCarli. Their kits include renewable power systems, internet connectivity, basic farm tools, micro-drip irrigation systems and water pumps that can be adapted to fit either a ground well or municipal water supply. 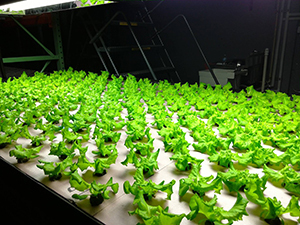 Urban, vertical farming is alive and well at MetroGrow Hawaii in Kakaako, Honolulu. MetroGrow began growing produce in 2013 when Kerry Kakazu, MetroGrow’s founder, acquired the farm’s urban facility, although Kakazu had wanted to grow fresh, sustainable food for quite a while. American Pavilion at 2015 World’s Fair. Courtesy Amy Storey. By focusing on building a quality product, encouraging community and supporting their farmer customers, Laramie, Wyoming-based Bright Agrotech looks to have a bright and busy future ahead of it. The company has continued to grow since Seedstock first profiled them here in 2012, something CEO and founder Dr. Nate Storey attributes to the broad appeal of the company’s mission. 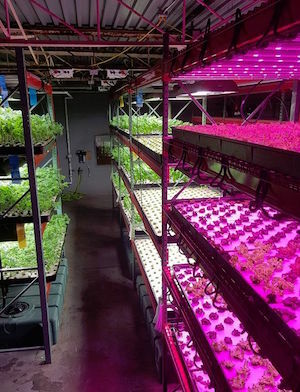 Deep in the corn belt, South Bend, Indiana may become home to a new indoor farming facility that would not only produce food but also educate community college students about indoor agriculture. The proposed 20,000-square foot vertical farming operation would be constructed and operated by Green Sense Farms, headquartered in northwest Indiana. Harvesters Alejandra Martinez (front), Steve Rodriguez, and Marquita Twidell cut basil grown in an aquaponic system at FarmedHere, a vertical farming operation based in Bedford Park, Illinois. Image courtesy of FarmedHere. 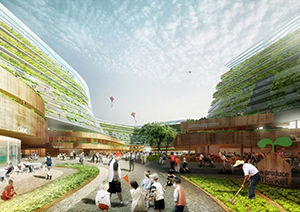 Vertical farms: the idea captures our imagination. We envision their upward-twisting frames nestled between the steel and chrome skyscrapers of the big city. 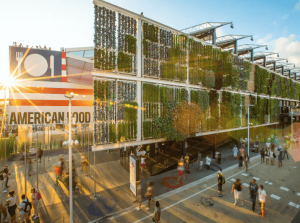 Each floor overflows with fruits and vegetables brought to life by hydroponic or aquaponic growing systems, bringing local food and a breath of fresh air to cities with a footprint smaller than any “horizontal” farm. A new paradigm for senior living is rising in famously lavish Singapore—one in which baby boomers can age in a comfortable environment that aids their mental and physical wellbeing through growing their own food.